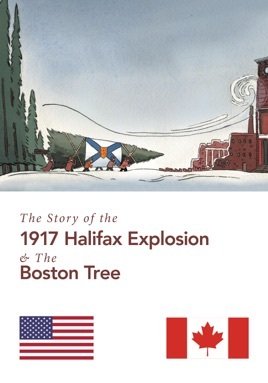 At 9:06 in the morning of December 6, 1917 in the City of Halifax, Nova Scotia two ships collided. Minutes later there was an apocalyptic explosion followed by a blizzard of flying glass, splintered wood and white hot metal falling from the sky. In an instant almost 2,000 people lay dead and another 9,000 wounded and thousands left homeless. This set in motion the greatest rescue mission ever known at the time between the United States and Canada. Within hours, without authority or hesitation the City of Boston and the State of Massachusetts pulled together all their medical resources and went to the aid of Halifax. This is the story of unprecedented compassion, mercy, and heroism. It speaks of the eternal friendship and helping hands across the border between the State of Massachusetts and the people of Nova Scotia. This humanitarian rescue mission was never forgotten. Every year a special thank you gift is sent to Boston from the people of Nova Scotia. This gift symbolizes peace on earth, hope and light in the darkness..... a giant fifty foot Christmas tree!